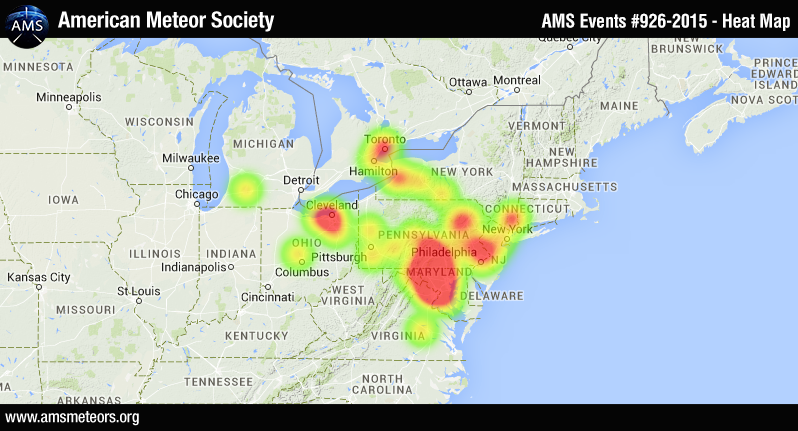 The American Meteor Society received over 50 reports so far about a fireball event in Maryland and southern Pensylvania on April 17th around 9:10pm EDT. Observers from as far north as Toronto in Canada reported seeing a bright light in the sky. Below is a heat map of the witness reports. The preliminary estimated trajectory plotted from the witness reports shows the meteor was traveling from the south east to the north west and ended its flight few miles north of Oxford, PA. Saw the fireball at around 9:10 pm Ap. 15. Have never seen one so close and expected to read about it on the news. looked like a shooting star, but up close, with a fiery center and greenish color around the edges. I live in Springfield VA and my wife and I saw it through the windshield of our car. appeared to be ENE of Washington, somewhere along the I-95 corridor or possibly just south of it. Saw this Fireball Friday night sitting around the fire with a few friends in Akron Ohio. Not sure on the time but it had to be around the 9pm range as we had just got settled in around the fire when it shot across the sky. I saw it, it was really stunning. I kept thinking, it looks like flames are shooting out…can’t be flames…we watched until it disappeared. I feel so lucky to have seen it. Saw a fireball last night (may 1 2015). We were driving North on route 212 between Woodstock, NY and Saugerties, NY around 9:30pm. It looked like a very large shooting star with a tail. It had an orange and blue hue to it. Looked like it was going to crash down, but disappeared in the distance. I’m in Tallahassee Florida, was out last night with my brother and friends. we was in different cars and see the same thing, Greenish flares around, with white in the middle. i thought it was going to hit how close it was. I live in Kennett Square, Pa, my husband and I went to drop off pallets at business but it was after hours so we were leaving them outside the gate. I jump in the bed of the truck and start unloading them off to him and I looked up I saw the Brightest “shooting star”, that is what I started to say anyway. It was bright bluegreen-ish on the rim outside and getting brighter blue towards the center (like a whitish-blue) with a sparkler-like long tail. It was so close and so bright and fast, by the time I got out the words to my husband and he turned to look, it had just fallen out of his eye line and mine right after. Once it had fallen we saw a really big blue flash like it had just crashed. I saw what I think was a meteor going at a slow pace over Carlisle, PA tonight 10/11/15.